The appearance of a regular ceramic magnet. As we see, the required materials to make a ribbon motor are permanent magnets, thin aluminum foil and something to craft chassis of. We will begin from the most confusing component - the magnets. Of course, I could just tell You the exact models of magnets to use and where to purchase them, but I have written these materials in order to provide a deeper understanding of the matter for You could think, decide and design Yourself. That's what DIY is about. There are four most widespread types of permanent magnets: ceramic (ferrite), AlNiCo (aluminum-nickel-cobalt-iron) and two types, that belong to rare-earth magnet group - SmCo (samarium-cobalt) and NeFeB or NIB (neodymium-iron-boron). Ceramic and AlNiCo magnets have been in use for long times and classical ribbon microphones were designed using these types. Rare-earth magnets were in development from some 70es and became publicly available in the beginning of 80es. This is an explanation of a huge ribbon microphone revival that begun in 90es, as new magnets were incredibly strong comparing to older types and allowed to design ribbon microphones with up-to-date characteristics. Samarium magnets of different shapes. There are various specs in description of magnetic properties of materials, but the one that is the most important for us is BHmax, measured in MGOes (megagauss-oersteds). I will not try to explain in details what it means, but in simple words BHmax defines the amount of energy the magnet can supply in relation to the volume of magnetic material. Consider it the "power" of magnet divided by its volume. Consequently, if we have few magnets of the same volume with different BHmax values, the one with the highest BHmax value will generate the strongest magnetic field. The BHmax of regular permanent magnets can vary in following ranges: 1 - 4 MGOes for ceramic magnets, 2 - 8 MGOes for AlNico magnets, while the BHmax of rare-earth magnets can be very impressive: 17 - 32 MGOes for SmCo magnets and, woohh, 28 - 52 MGOes for NeFeB magnets. Naturally, the best choice for modern ribbon microphones is neodymium. A bunch of spherical neodymium magnets. 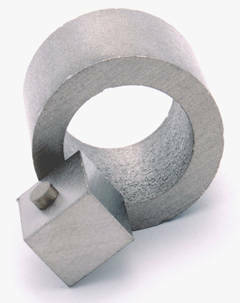 Commercially available NeFeB magnets are indexed as, for example, N36, N40, N50, etc. The "N" stands for "neodymium" and the number represent the BHmax of a magnet. 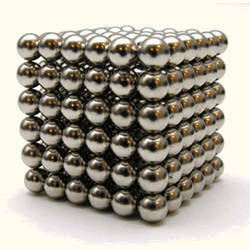 The strongest widely available magnets are N42 (the neodymium magnets with BHmax of 42 MGOes). Nowadays manufacturers usually have N50 magnets on stock, but available shapes are somewhat limited. N52 are available as custom orders, so You have to deal with the reasonable minimum order and high price. I use regular N42 magnets in my motors and they work fine. You should be aware of few thing when using neodymium magnets. First, they are very brittle and have to be handled with care. If You accidentally let them freely attract to each other (it can happen from a major distance), they are most likely to break. The problem is, that some small needle-sharp pieces can be hit-off under the impact possessing a potential danger for Your eyes, so protective glasses is a very good idea during handling. Second, You must not try to cut, saw or drill neodymium magnets, as dust is flammable and will result in a toxic smoke if ignited. At high concentration and temperature (for example, if You drill it with a high speed drilling machine) it can even cause an explosion. Third, don't expose magnets to heat. It is not dangerous, but regular neodymium magnets start loosing their magnetic properties if temperature is over 80C (176F). Magnet pole positions in a ribbon motor. Magnets are magnetized through the surfaces that face us. Dashed line represents the virtual border between poles. Another important property of a magnet is the magnetization direction. In simple words it defines location of poles. As You know, each magnet has two poles N (North) and S (South). If a magnet is block-shaped (the shape that is needed for our purpose) both poles are located on parallel surfaces. A block-shaped object has three pairs of parallel surfaces, so we have to know what surfaces poles are located on, as it is important for a motor design. This property is described by a magnetization direction parameter. 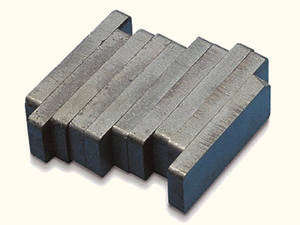 Classically, magnetization direction of block magnets was referred as "through width", "through length" and "through thickness". The dimensions are described in following order: length x width x thickness. Imagine it, like if some virtual surface would perpendicularly pierce through (that's why this word is used) the selected dimension. In this case, poles would be located on surfaces that are parallel to this virtual surface. Some manufacturers define it this way, but some just define the factual dimension a magnet is magnetized through as "thickness". Some just provide dimensions, like 2.0" x 1/4" x 1/8", and note the dimension a magnet is magnetized through, like "magnetized through 1/8". Magnets are usually magnetized through the smallest dimension for poles to be located on largest surfaces. For ribbon microphone applications we need both magnets to face the ribbon with surfaces that carry the opposite poles, so the magnetization direction with poles on largest surfaces is exactly what we need. You might want to get Yourself a very useful tool - a small magnet with a N pole marked. Knowing that opposite poles always attract to each other You can use it to check the location of poles on magnets You are working with. 2" x 1/4" x 1/8" neodymium block magnet - one of the most popular shapes for DIY ribbon motors. As I've mentioned, the most useful shape for DIY designs is block. Some other options, like horseshoe shaped magnets, can be applied too, but these are going to be bit more advanced designs. I have even seen some exotic designs that used disk or cylinder magnets, but we will concentrate on the most straight-forward solution further - block. The most useful lengths are between 1" and 2", magnets are usually manufactured with lengths increasing in 1/4" steps. Width is usually taken as 1/4", it determines the depth of the gap and thickness of You motor (do not confuse with thickness of a magnet itself!). Thickness of magnet can be between 1/16" and 1/4", it adds to the width of Your motor. Of course, these numbers are not ultimate and You are free to experiment with any sizes, these are just good starting points. These magnets will soon be available in our store. a shape similar to Royer R-series. for use in narrow ribbon motors. 1 1/2" x 1/4" x 1/8"
a shorter alternative for popular shape. 1 1/2" x 1/4" x 1/4"
a useful one - fat and powerful.